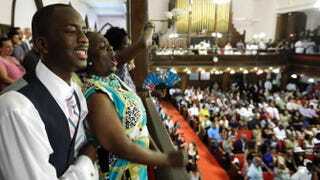 Parishioners Shakur Francis and Karen Watson-Fleming sing as they attend the first church service four days after a mass shooting that claimed the lives of nine people at the historic Emanuel African Methodist Episcopal Church June 21, 2015, in Charleston, S.C.
A $3 million scholarship fund set up in the name of the Rev. Clementa Pinckney was announced Thursday in Charleston, S.C., scene of the horrific mass shooting that claimed the lives of nine parishioners at Emanuel African Methodist Episcopal Church, including Pinckney, who was also a state senator. Here is an excerpt from the press release announcing the generous donations. The tragedy of the shooting at the Mother Emanuel African Methodist Episcopal (AME) Church in Charleston, S.C., has brought forth the best of generosity in the wake of a crisis. Each instance of a gift has been inspiring and amazing in scope. Anonymous donors have now come forward to announce a scholarship fund for the members of the extended Mother Emanuel AME Church community.The donors wish to be anonymous. We do not pretend to understand the pain caused by this unimaginable tragedy. We simply want members of the Mother Emanuel African Methodist Episcopal Church community to know that the burdens of perseverance and empathy, which they have demonstrated with such dignity, do not fall exclusively on their shoulders. We want them to know that others, most of whom do not share their race or religion, who do not come from South Carolina, abhor the injustices from which they have suffered and admire the ways the African-American community has enriched our nation. We honor Reverend Pinckney who so profoundly embodied the values that bind us together as Americans. The donors have committed in excess of $3 million to the Reverend Pinckney Scholarship Fund, a non-profit corporation registered in the State of South Carolina. The Fund will provide college and advanced degree scholarships for members of the extended Mother Emanuel AME Church community including the families of the victims of the June 17, 2015 tragedy.